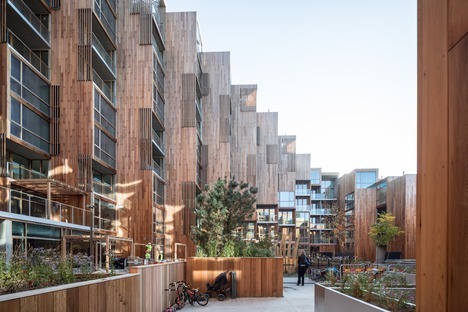 A residential building covered with cedar wood designed by Bjarke Ingels Group in Stockholm’s Gärdet district combines a panoramic view with choice of materials in line with the environment. As the apartments stand at the gateway to the city on the edge of a national park of great importance, it was only logical that they should interact with the amazing view. The architects of BIG therefore designed a courtyard building composed of standard prefabricated elements, in which a 3.60x3.60m module is stepped along an ideal axis on the diagonal of the lot. 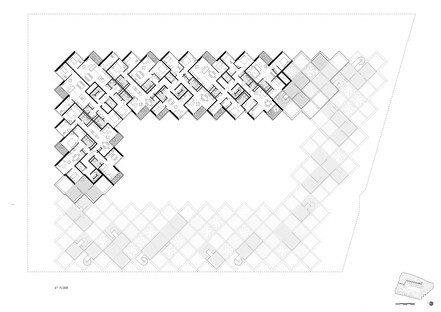 In this way, all of the 25,000 sqm of apartments have equally interesting views over the park, in that the northeast corner, which may seem disadvantaged in relation to the view, is raised to 35m in height to give its inhabitants a higher view, while the opposite corner, which is lower (7 m), has a more direct view of the park, unhindered by obstacles. 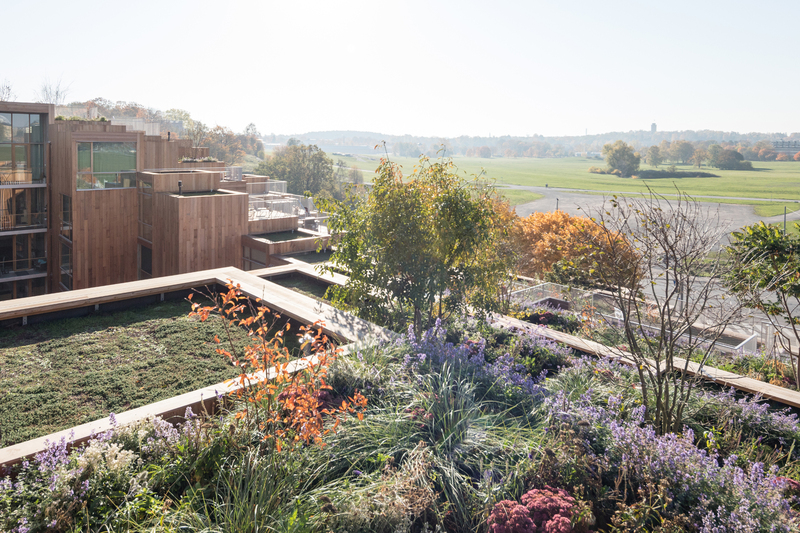 Each of the 169 apartments has a terrace on the roof of the apartments below it, planted with exuberant leafy vegetation which, in combination with the widespread use of cedar wood on the walls, makes the building look like an artificial hill when seen from a distance. 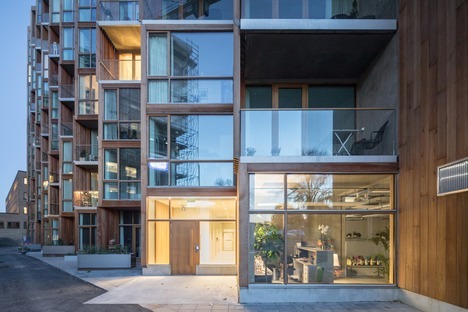 The light planks of wood are positioned in a regular sequence around the outside of the windows, with vertical planks on the windowless walls; there is no alternation with other materials apart from the glass of the big windows. Their frames are also made of wood, creating a homogeneous, welcoming look in every corner. While the home’s structural frame is made out of even humbler concrete, the interiors, designed with the same care, present glimpses of the material, creating a balanced contrast between materials with a valuable touch of modernity. Moreover, mobile wooden panels act as sunbreaks at specific spots in the project, not only to put together the façade in an alternative way, but to modulate the sun’s rays when necessary. In this way, a new composition appears in the cityscape that creates an intelligent transition towards the natural landscape.